Free Wi-Fi Available At All Sites! 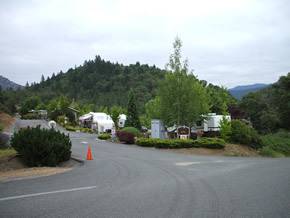 Moon Mountain RV Resort is a year round park situated in the beautiful Rogue Valley. We are centrally located to everything the valley has to offer, yet we have the country side feel of being farther away from a large city. We welcome you to a quiet, friendly place to relax and enjoy the magnificent view of the surrounding mountains. You can take a stroll down the hill from the Resort, walk through Tom Pearce Park (day use) and wander along the beautiful Rogue River, a popular place for salmon & steelhead fishing. Tom Pearce Park has two large pavilions for reunions, weddings & group gatherings. You may call Josephine County Parks Dept. (541) 474-5285 to reserve a pavilion for your gatherings. We are located on the South end of Grants Pass, overlooking the foothills that contain the world famous Rogue River and the recreation opportunities it provides. Our park has 50 RV Sites with 24 pull through sites. The sites include full hook-ups, free Wi-Fi, extended cable package, 20/30/50 amp electrical service and a wonderful view. Our facilities includeon-site propane, clean restrooms and showers, full service laundry and daily, weekly and monthly rates. We are located at exit 55, which is 55 miles north of the California Boarder on Interstate 5. Easy access to and from the freeway for any size RV. 2 hours from the Oregon Coast (Brookings, Gold Beach, Crescent City). Less than 1 hour to Seven Feathers Casino in Canyonville. 1 1/2 hours from the redwoods. 1 1/2 hours from Crater Lake. 1 hour from Oregon Caves. 1/2 hour from world famous Harry & David, Jackson & Perkins rose headquarters. Fishing (Brookings, Rogue River), boating (Applegate Lake, Diamond Lake) and rafting and jet boat excursions (Hellgate, Rogue Wilderness Adventures, Noah's Rafting) close by. 5 minutes to Grants Pass or 25 minutes to Medford for shopping, fine dining and entertainment including the Ashland Shakespeare Festival and the Jacksonville Britt Concerts. Day excursions to see the many waterfalls in the area, covered bridges, historic towns, museums, art galleries, hiking, antique shops, botanical trails, bicycling, Wildlife Images, Butte Creek Mill, Rogue Creamery, wineries.